John Shinas is a Business Development Manager with Insulating Services, Inc., (www.insulatingservices.com), an industrial and commercial insulation contractor and distributor. Their core competency is project execution on large capital industrial projects among various industries such as manufacturing, pharmaceutical, pulp and paper, diversified chemical, petrochemical, and many more. Mr. Shinas has 18 years’ experience overall with 11 in the insulation industry. He is a Mechanical Engineer and his area of expertise is in heat transfer and thermodynamics. He can be reached at JShinas@insulatingservices.com. 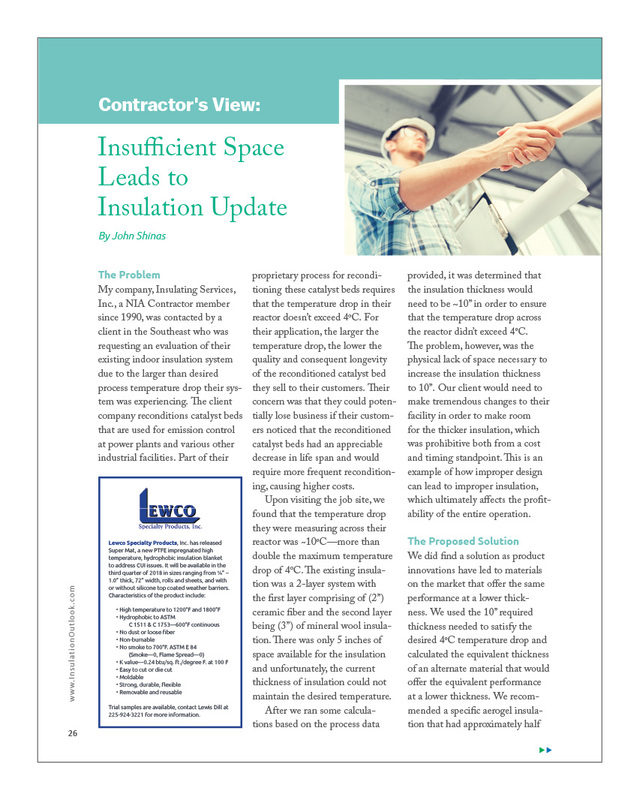 My company, Insulating Services, Inc., a NIA Contractor member since 1990, was contacted by a client in the Southeast who was requesting an evaluation of their existing indoor insulation system due to the larger than desired process temperature drop their system was experiencing. The client company reconditions catalyst beds that are used for emission control at power plants and various other industrial facilities. Part of their proprietary process for reconditioning these catalyst beds requires that the temperature drop in their reactor doesn’t exceed 4°C. For their application, the larger the temperature drop, the lower the quality and consequent longevity of the reconditioned catalyst bed they sell to their customers. Their concern was that they could potentially lose business if their customers noticed that the reconditioned catalyst beds had an appreciable decrease in life span and would require more frequent reconditioning, causing higher costs. Upon visiting the job site, we found that the temperature drop they were measuring across their reactor was ~10°C—more than double the maximum temperature drop of 4°C. The existing insulation was a 2-layer system with the first layer comprising of (2”) ceramic fiber and the second layer being (3”) of mineral wool insulation. There was only 5 inches of space available for the insulation and unfortunately, the current thickness of insulation could not maintain the desired temperature. After we ran some calculations based on the process data provided, it was determined that the insulation thickness would need to be ~10” in order to ensure that the temperature drop across the reactor didn’t exceed 4°C. The problem, however, was the physical lack of space necessary to increase the insulation thickness to 10”. Our client would need to make tremendous changes to their facility in order to make room for the thicker insulation, which was prohibitive both from a cost and timing standpoint. This is an example of how improper design can lead to improper insulation, which ultimately affects the profitability of the entire operation. We did find a solution as product innovations have led to materials on the market that offer the same performance at a lower thickness. We used the 10” required thickness needed to satisfy the desired 4°C temperature drop and calculated the equivalent thickness of an alternate material that would offer the equivalent performance at a lower thickness. We recommended a specific aerogel insulation that had approximately half the thermal conductivity of the existing insulation system at the operating temperature of 500°C. Specifically, we were able to reduce the thickness from 10” to 4.8” by recommending the aerogel material. The total installed cost of this option would be approximately 23% higher than the required 10” thickness of the existing insulation, but in this situation this is a moot consideration since there wasn’t enough space to increase the existing insulation thickness to 10”. In summary, there are 2 problems to solve in this situation. First, the existing insulation system was not designed to limit the temperature drop to the desired threshold of 4°C. Second, space constraints did not allow for the appropriate thickness to achieve the desired goal. Our recommendation of using a different product that would provide appropriate performance at a lower thickness solved both problems in this case. Ultimately, the client will need to decide whether to accept the added cost of installing the aerogel insulation in exchange for its potential benefits. Of course, as with most properly designed systems, insulating the system correctly will save energy over the life of the system, paying for the insulation. Changing the footprint of the facility to accommodate the 10” of required thickness for the lower-cost mineral wool would incur exorbitant costs. While typically, “value engineering” implies a lower upfront cost, in cases like this one, clients may choose a higher up-front cost as the best alternative and in exchange for continued ongoing successful operations.